Right temporal epidural hematoma with midline shift. Patient should be taken immediately to the operating room for neurosurgery. This may require emergent transport to a trauma center or other facility with a neurosurgeon available. Brain CT scan of 90-year-old man who slipped on a waxed floor. Witnesses reported loss of consciousness followed by a "lucid interval." Patient arrived to ED unconscious. 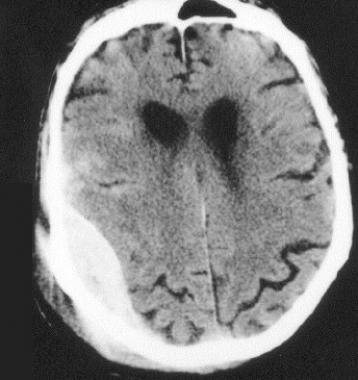 CT scan indicates epidural hematoma. Image courtesy of Dr Dana Stearns, Massachusetts General Hospital. Approximately 70-80% of epidural hematomas (EDHs) are located in the temporoparietal region where skull fractures cross the path of the middle meningeal artery or its dural branches. Frontal and occipital epidural hematomas each constitute about 10%, with the latter occasionally extending above and below the tentorium. Association of hematoma and skull fracture is less common in young children because of calvarial plasticity. Epidural hematomas are usually arterial in origin but result from venous bleeding in one third of patients. Occasionally, torn venous sinuses cause an epidural hematoma, particularly in the parietal-occipital region or posterior fossa. These injuries tend to be smaller and associated with a more benign course. Usually, venous epidural hematomas only form with a depressed skull fracture, which strips the dura from the bone and, thus, creates a space for blood to accumulate. In certain patients, especially those with delayed presentations, venous epidural hematomas are treated nonsurgically. Expanding high-volume epidural hematomas can produce a midline shift and subfalcine herniation of the brain. Compressed cerebral tissue can impinge on the third cranial nerve, resulting in ipsilateral pupillary dilation and contralateral hemiparesis or extensor motor response. Epidural hematomas are usually stable, attaining maximum size within minutes of injury; however, Borovich et al demonstrated progression of epidural hematoma in 9% of patients during the first 24 hours. Rebleeding or continuous oozing presumably causes this progression. An epidural hematoma can occasionally run a more chronic course and is detected only days after injury. Epidural hematoma occurs in 1-2% of all head trauma cases and in about 10% of patients who present with traumatic coma. Reported mortality rates range from 5-43%. Mortality rates are essentially nil for patients not in coma preoperatively and approximately 10% for obtunded patients and 20% for patients in deep coma. Patients younger than 5 years and older than 55 years have increased mortality. Patients younger than 20 years account for 60% of EDHs. EDH is uncommon in elderly patients because the dura is strongly adhered to the inner table of the skull. In case series of EDH, fewer than 10% of patients are older than 50 years. If treated early, prognosis usually is excellent, because the underlying brain injury generally is limited. Bir SC, Maiti TK, Ambekar S, Nanda A. Incidence, hospital costs and in-hospital mortality rates of epidural hematoma in the United States. Clin Neurol Neurosurg. 2015 Nov. 138:99-103. [Medline]. Binder H, Majdan M, Tiefenboeck TM, Fochtmann A, Michel M, Hajdu S, et al. Management and outcome of traumatic epidural hematoma in 41 infants and children from a single center. Orthop Traumatol Surg Res. 2016 Oct. 102 (6):769-74. [Medline]. Pereira EL, Rodrigues DB, Lima LO, Sawada LA, Hermes Mde N Jr. Bilateral assymetric epidural hematoma. Surg Neurol Int. 2015 Jan 30. 6:14. [Medline]. Paiva WS, Andrade AF, Alves AC, Ribeiro IN, Teixeira MJ. Bilateral acute epidural hematoma with good outcome. J Clin Diagn Res. 2013 Nov. 7 (11):2594-5. [Medline]. Borovich B, Braun J, Guilburd JN, et al. Delayed onset of traumatic extradural hematoma. J Neurosurg. 1985 Jul. 63(1):30-4. [Medline]. Flaherty BF, Loya J, Alexander MD, Pandit R, Ha BY, Torres RA, et al. Utility of clinical and radiographic findings in the management of traumatic epidural hematoma. Pediatr Neurosurg. 2013. 49(4):208-14. [Medline]. Paiva WS, Andrade AF, Amorim RL, Bor-Seng-Shu E, Gattas G, Neville IS, et al. Computed tomography angiography for detection of middle meningeal artery lesions associated with acute epidural hematomas. Biomed Res Int. 2014. 2014:413916. [Medline]. [Full Text]. Nelson JA. Local skull trephination before transfer is associated with favorable outcomes in cerebral herniation from epidural hematoma. Acad Emerg Med. 2011 Jan. 18(1):78-85. [Medline]. Smith SW, Clark M, Nelson J, Heegaard W, Lufkin KC, Ruiz E. Emergency department skull trephination for epidural hematoma in patients who are awake but deteriorate rapidly. J Emerg Med. 2010 Sep. 39(3):377-83. [Medline]. [Guideline] Brain Trauma Foundation; American Association of Neurological Surgeons; Congress of Neurological Surgeons; Joint Section on Neurotrauma and Critical Care, AANS/CNS. Guidelines for the management of severe traumatic brain injury. I. Blood pressure and oxygenation. J Neurotrauma. 2007. 24 Suppl 1:S7-13. [Medline]. [Full Text]. [Guideline] Brain Trauma Foundation; American Association of Neurological Surgeons; Congress of Neurological Surgeons; Joint Section on Neurotrauma and Critical Care, AANS/CNS. Guidelines for the management of severe traumatic brain injury. II. Hyperosmolar therapy. J Neurotrauma. 2007. 24 Suppl 1:S14-20. [Medline]. [Full Text]. [Guideline] Brain Trauma Foundation; American Association of Neurological Surgeons; Congress of Neurological Surgeons; Joint Section on Neurotrauma and Critical Care, AANS/CNS. Guidelines for the management of severe traumatic brain injury. IV. Infection prophylaxis. J Neurotrauma. 2007. 24 Suppl 1:S26-31. [Medline]. [Full Text]. [Guideline] Brain Trauma Foundation; American Association of Neurological Surgeons; Congress of Neurological Surgeons; Joint Section on Neurotrauma and Critical Care, AANS/CNS. Guidelines for the management of severe traumatic brain injury. XI. Anesthetics, analgesics, and sedatives. J Neurotrauma. 2007. 24 Suppl 1:S71-6. [Medline]. [Full Text]. [Guideline] Brain Trauma Foundation; American Association of Neurological Surgeons; Congress of Neurological Surgeons; Joint Section on Neurotrauma and Critical Care, AANS/CNS. Guidelines for the management of severe traumatic brain injury. XIII. Antiseizure prophylaxis. J Neurotrauma. 2007. 24 Suppl 1:S83-6. [Medline]. [Full Text]. [Guideline] Brain Trauma Foundation; American Association of Neurological Surgeons; Congress of Neurological Surgeons; Joint Section on Neurotrauma and Critical Care, AANS/CNS. Guidelines for the management of severe traumatic brain injury. XIV. Hyperventilation. J Neurotrauma. 2007. 24 Suppl 1:S87-90. [Medline]. [Full Text]. [Guideline] Brain Trauma Foundation; American Association of Neurological Surgeons; Congress of Neurological Surgeons; Joint Section on Neurotrauma and Critical Care, AANS/CNS. Guidelines for the management of severe traumatic brain injury. XV. Steroids. J Neurotrauma. 2007. 24 Suppl 1:S91-5. [Medline]. [Full Text]. [Guideline] Bratton SL, Chestnut RM, Ghajar J, et al. Guidelines for the management of severe traumatic brain injury. IX. Cerebral perfusion thresholds. J Neurotrauma. 2007. 24 Suppl 1:S59-64. [Medline]. [Full Text]. Irie F, Le Brocque R, Kenardy J, Bellamy N, Tetsworth K, Pollard C. Epidemiology of traumatic epidural hematoma in young age. J Trauma. 2011 Oct. 71(4):847-53. [Medline]. [Guideline] Adelson PD, Bratton SL, Carney NA, et al. Guidelines for the acute medical management of severe traumatic brain injury in infants, children, and adolescents. Chapter 1: Introduction. Pediatr Crit Care Med. 2003 Jul. 4(3 Suppl):S2-4. [Medline]. [Guideline] American Association of Neurological Surgeons. Guidelines for the management of severe head injury. Congress of Neurological Surgeons:1995. Bricolo AP, Pasut LM. Extradural hematoma: toward zero mortality. A prospective study. Neurosurgery. 1984 Jan. 14(1):8-12. [Medline]. Davis DP, Peay J, Sise MJ, et al. The impact of prehospital endotracheal intubation on outcome in moderate to severe traumatic brain injury. J Trauma. 2005 May. 58(5):933-9. [Medline]. 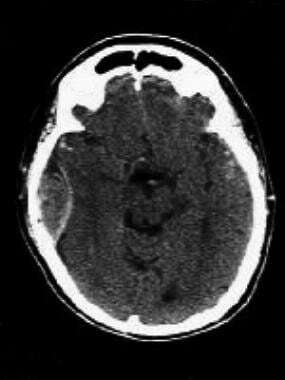 Ersahin Y, Mutluer S. Air in acute extradural hematomas: report of six cases. Surg Neurol. 1993 Jul. 40(1):47-50. [Medline]. Grossman RG, Hamilton WJ. Principles of Neurosurgery. 2nd ed. Lippincott Williams & Wilkins Publishers; 1998. Narayan RK, Wilberger JE Jr, Povlishock JT, eds, et al. Neurotrauma. McGraw Hill Text; 1996. Roberts J, Hedges J, Fletcher J, ed. Clinical Procedures in Emergency Medicine. 4th ed. WB Saunders Co; 2003. Schmidek HH, Sweet WH. Operative Neurosurgical Techniques: Indications, Methods, and Results. 4th ed. W B Saunders Co; 2000. Servadei F. Prognostic factors in severely head injured adult patients with epidural haematoma's. Acta Neurochir (Wien). 1997. 139(4):273-8. [Medline]. Temkin NR, Dikmen SS, Wilensky AJ. A randomized, double-blind study of phenytoin for the prevention of post-traumatic seizures. N Engl J Med. 1990 Aug 23. 323(8):497-502. [Medline]. Yablon SA. Posttraumatic seizures. Arch Phys Med Rehabil. 1993 Sep. 74(9):983-1001. [Medline].